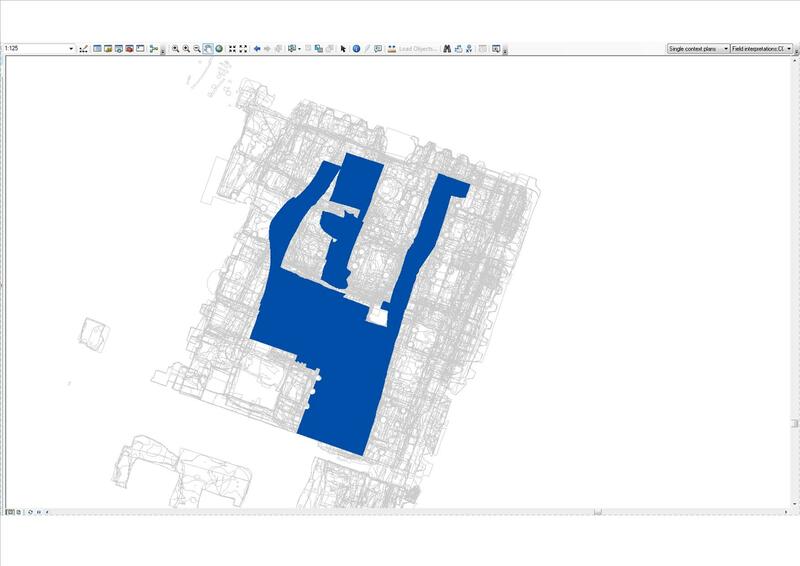 This week our post-excavation work took a leap forward: the digitising of the single-context plans has been completed and loaded into GIS (Geographic Information System). This means we can see every context from our site on one screen! So how did we create this grey web, and what can we do with it? 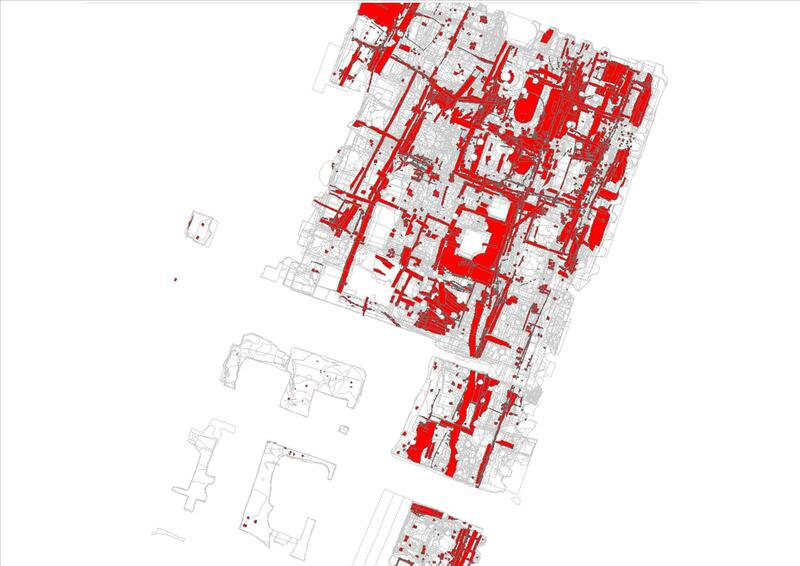 All archaeological organisations have different ways of working, and MOLA have developed their methods to suit the often confined and restricted urban spaces we usually work in. At MOLA, we have a Geomatics team (surveyors) who aid the archaeologists in capturing an accurate 3D picture of the site. Each site or trench will require a base line or site grid to be established by the Geomatics team using a Leica Total Station. The grid or base line will be in line with the trench or area edges north-south and/or east-west. Each point on the grid or baseline are given co-ordinates (or letters in some cases) specific to each site. Features on site are then planned in relation to these points. The grid on site is located in the wider world, working out their position on the Ordnance Survey National Grid by using known points in the area, such as the corner of a church. 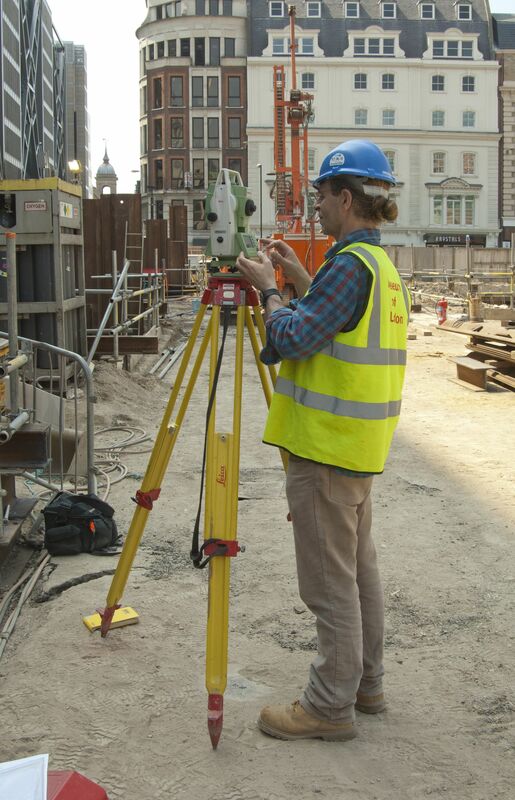 A temporary bench mark (TBM) is also created on site, and is often traversed from an Ordnance Survey Bench Mark from street level or again on a building; this gives us a level measure in metres above sea level that we can then record from on site. Once this has all been set out, anything you record on site can be located 3-dimensionally and then we are able to locate it in the outside world. On site we record features onto permatrace film, each piece representing a 5m grid square. If grid squares are not present, then the feature is drawn on the permatrace showing its location in relation to the base line. This is how features are recorded in urban environments using the single context recording method (i.e. each context gets its own plan). As previously mentioned, other archaeology units may use different methods, such as the multi-context system, which is much more suited to rural excavations where the features are spread out. 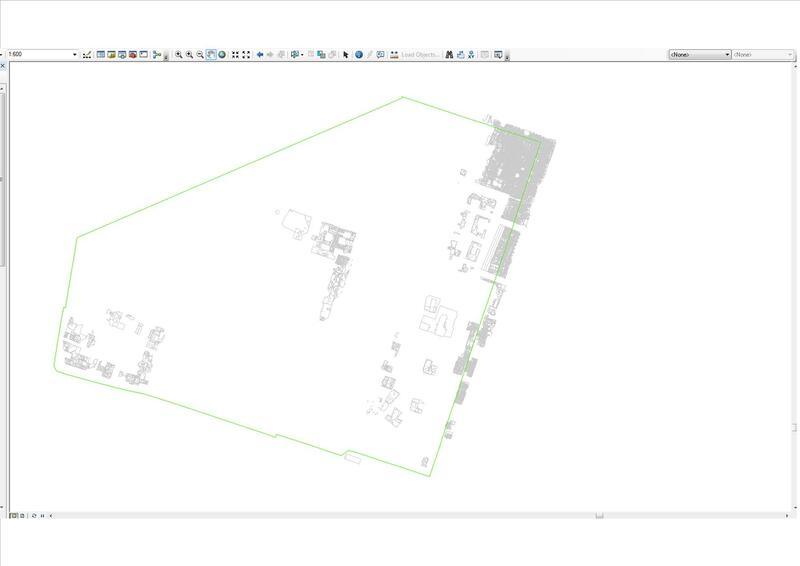 Back in the office, each plan is digitised — traced and plotted using a drawing board or tablet that is compatible with CAD (Computer Aided Design) software — and saved as a DWG (DraWinG) file. 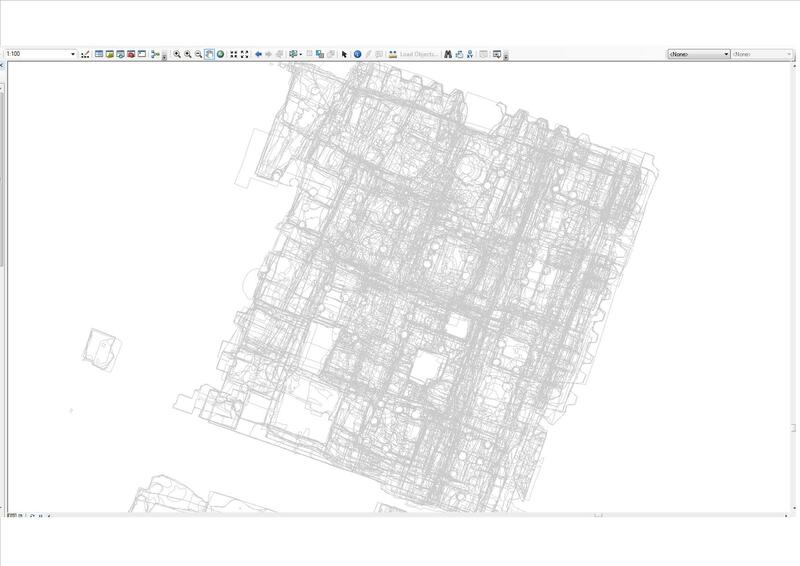 When all of this is done, the plans are compiled into one large shape file, which can be loaded into GIS and manipulated. Additional data from neighbouring sites, such as Number One Poultry, can be loaded alongside and used for comparison. 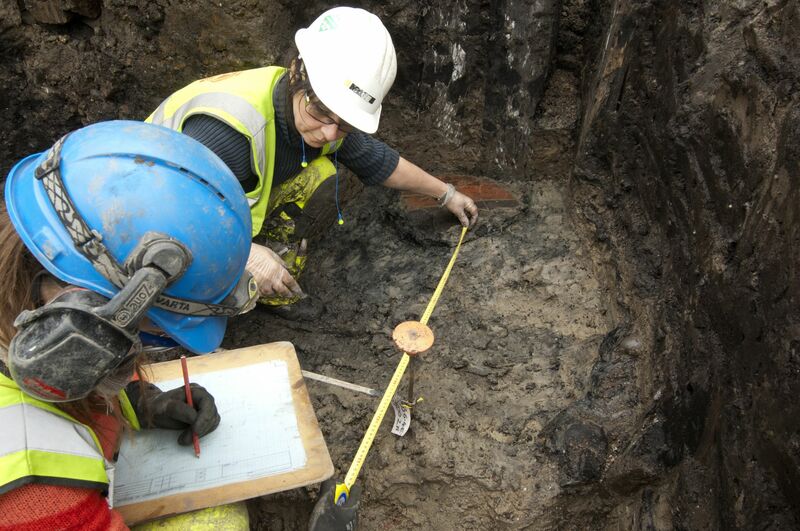 This is something we will use later in the post-excavation process. So what can we do with this data, apart from get a headache? Firstly the supervisory team had a lesson from our Geomaticians. We are pretty computer literate, but need to make sure we understand where the data is saved and how it can be manipulated – so we don’t do anything stupid like delete it. Surfaces and ditches, or a man with his arms raised? BAJR (British Archaeological Jobs and Resources) have some great guides about recording and surveying if you would like to find out more. This is so interesting. Once all the data is in you can mine the database in so many different ways, depending on what you want to look at. Thank you for explaining how it is recorded.